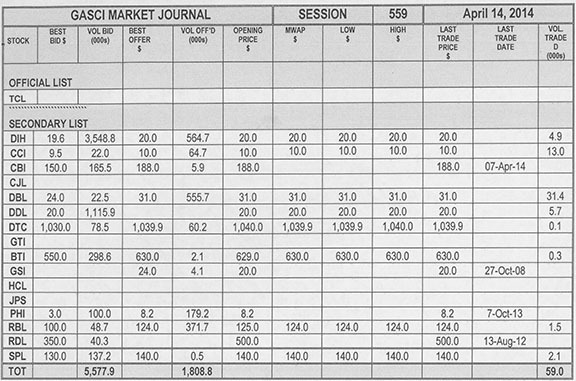 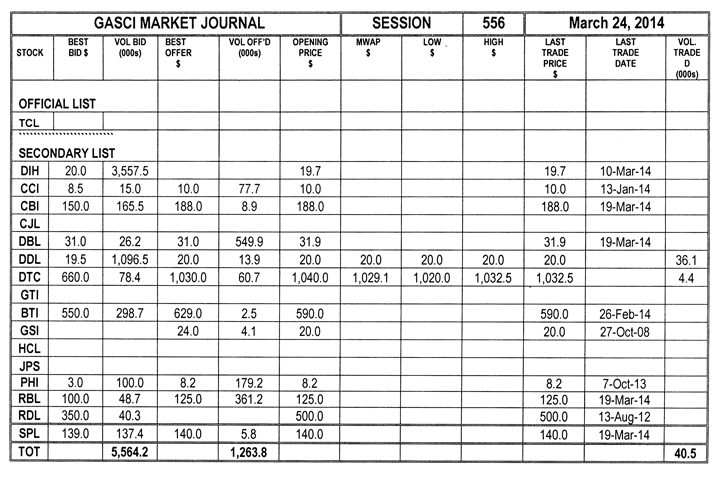 GASCI (www.gasci.com/telephone Nº 223-6175/6) reports that session 606’s trading results showed consideration of $16,422,537 from 406,554 shares traded in 18 transactions as compared to session 605’s trading results, which showed consideration of $711,622 from 16,487 shares traded in 9 transactions. 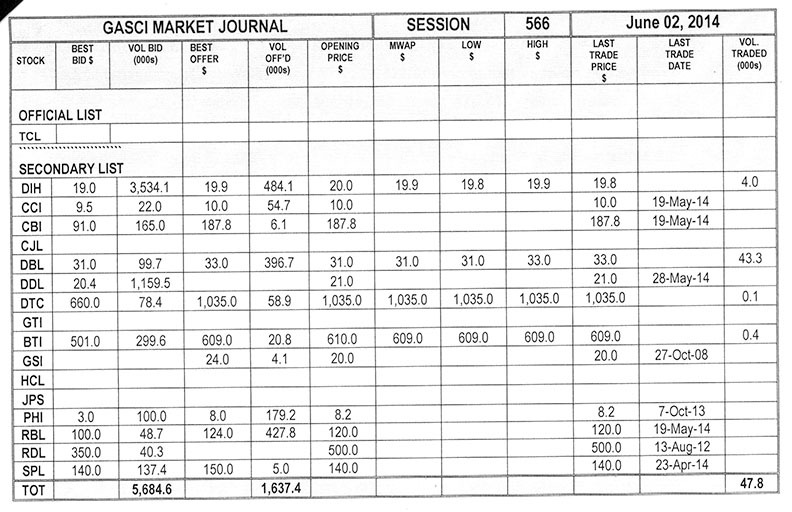 GASCI (www.gasci.com/telephone Nº 223-6175/6) reports that session 605’s trading results showed consideration of $711,622 from 16,487 shares traded in 9 transactions as compared to session 604’s trading results, which showed consideration of $29,316,743 from 262,239 shares traded in 30 transactions. 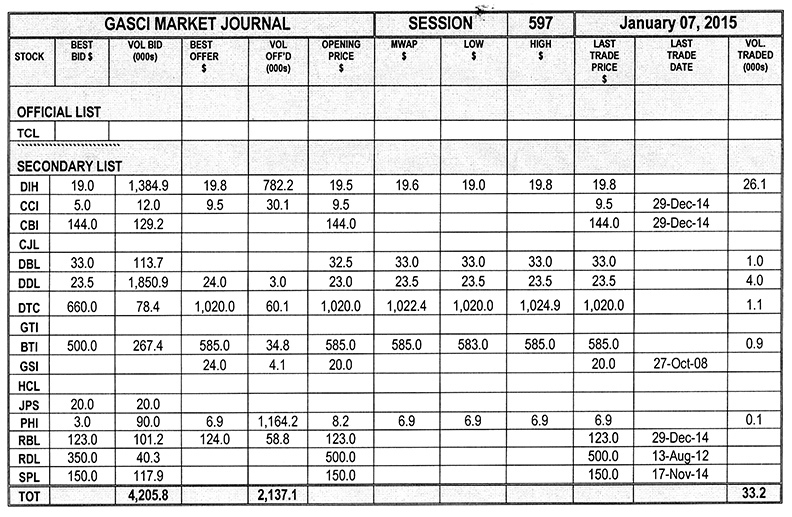 GASCI (www.gasci.com/telephone Nº 223-6175/6) reports that session 604’s trading results showed consideration of $29,316,743 from 262,239 shares traded in 30 transactions as compared to session 603’s trading results, which showed consideration of $4,327,173 from 58,745 shares traded in 27 transactions. 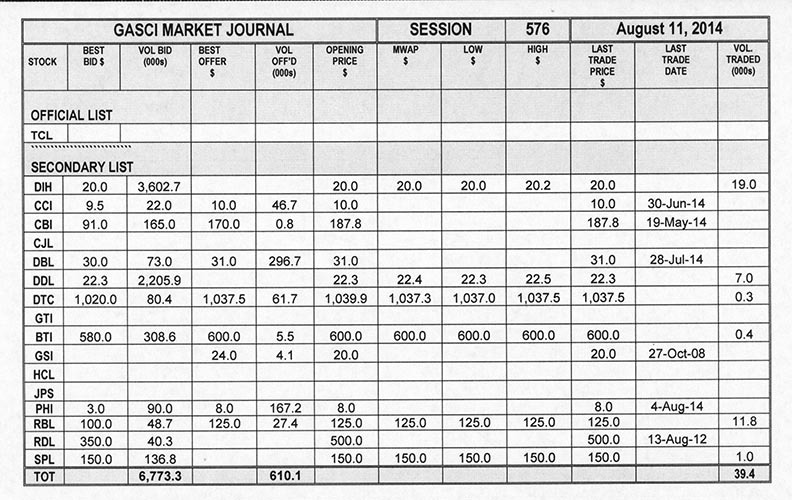 GASCI (www.gasci.com/telephone Nº 223-6175/6) reports that session 603’s trading results showed consideration of $4,327,173 from 58,745 shares traded in 27 transactions as compared to session 602’s trading results, which showed consideration of $4,552,359 from 147,915 shares traded in 21 transactions. 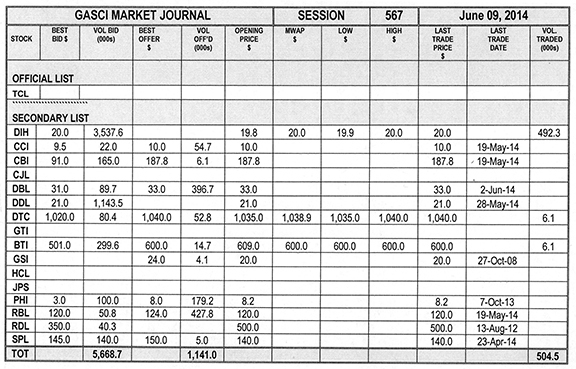 GASCI (www.gasci.com/telephone Nº 223-6175/6) reports that session 602’s trading results showed consideration of $4,552,359 from 147,915 shares traded in 21 transactions as compared to session 601’s trading results, which showed consideration of $49,088,362 from 905,442 shares traded in 51 transactions. 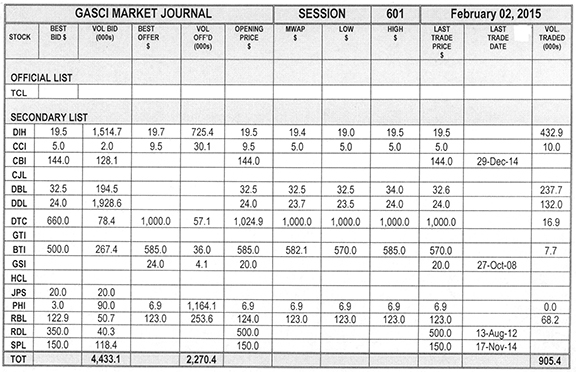 GASCI (www.gasci.com/telephone Nº 223-6175/6) reports that session 601’s trading results showed consideration of $49,088,362 from 905,442 shares traded in 51 transactions as compared to session 600’s trading results, which showed consideration of $1,263,400 from 50,600 shares traded in 8 transactions. 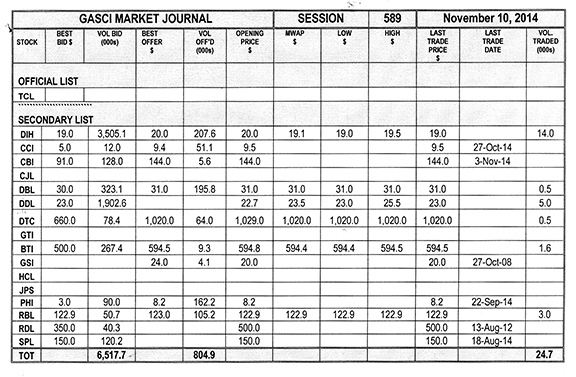 GASCI (www.gasci.com/telephone Nº 223-6175/6) reports that session 599’s trading results showed consideration of $1,348,103 from 8,675 shares traded in 9 transactions as compared to session 598’s trading results, which showed consideration of $170,670 from 4,190 shares traded in 4 transactions. 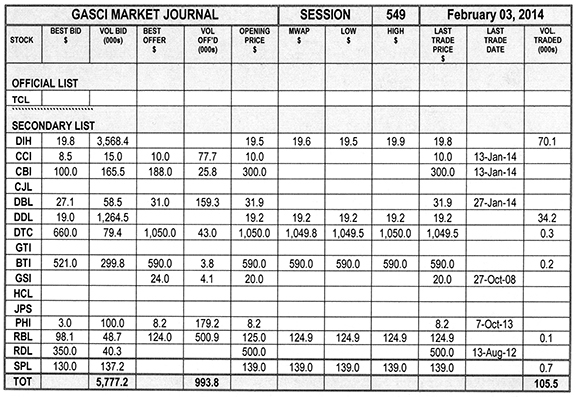 GASCI (www.gasci.com/telephone Nº 223-6175/6) reports that session 598’s trading results showed consideration of $170,670 from 4,190 shares traded in 4 transactions as compared to session 597’s trading results, which showed consideration of $2,283,010 from 33,170 shares traded in 22 transactions. 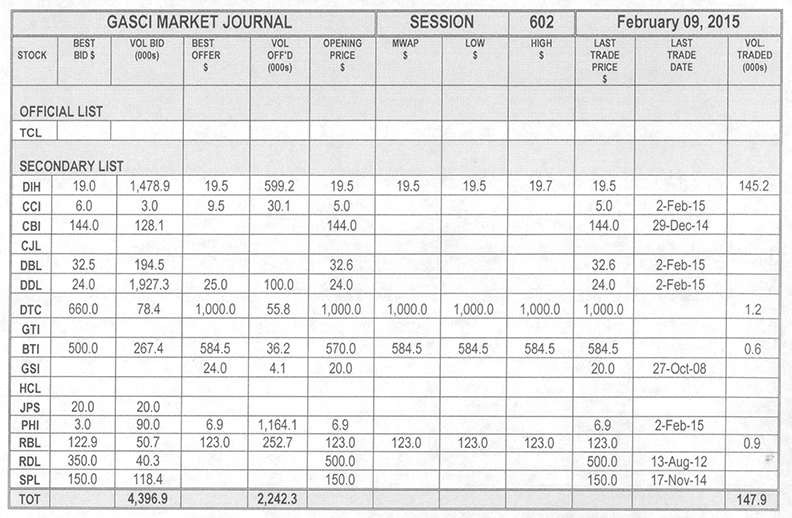 GASCI (www.gasci.com/telephone Nº 223-6175/6) reports that session 597’s trading results showed consideration of $2,283,010 from 33,170 shares traded in 22 transactions as compared to session 596’s trading results, which showed consideration of $1,100,544 from 47,580 shares traded in 13 transactions. 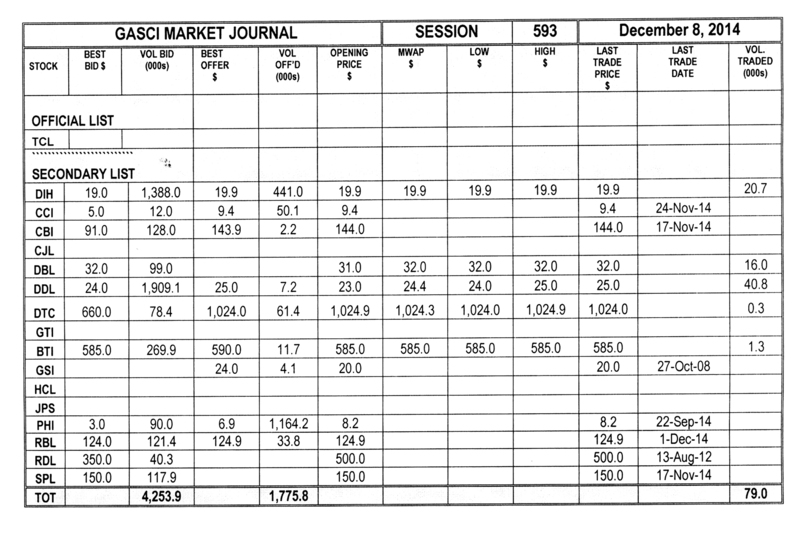 GASCI (www.gasci.com/telephone Nº 223-6175/6) reports that session 594’s trading results showed consideration of $14,888,868 from 632,472 shares traded in 10 transactions as compared to session 593’s trading results, which showed consideration of $2,957,539 from 79,047 shares traded in 10 transactions. 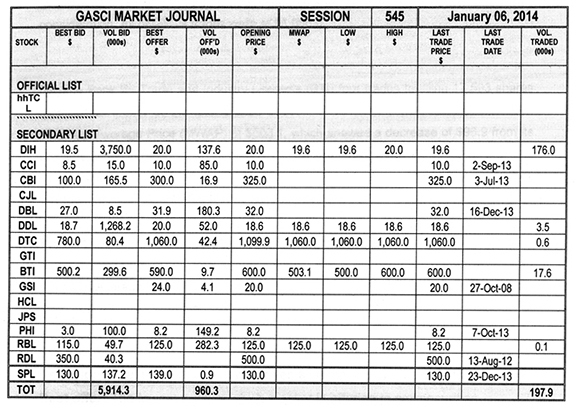 GASCI (www.gasci.com/telephone Nº 223-6175/6) reports that session 592’s trading results showed consideration of $4,493,917 from 22,430 shares traded in 9 transactions as compared to session 591’s trading results, which showed consideration of $20,459,565 from 440,091 shares traded in 24 transactions. 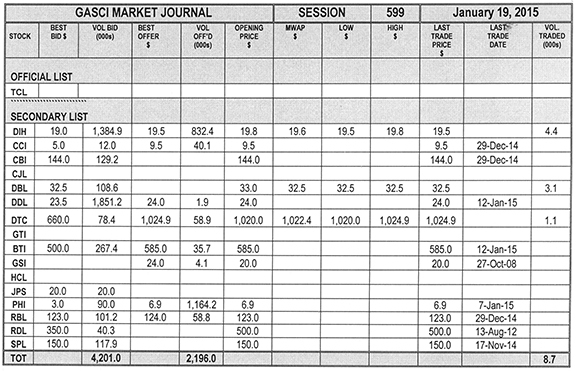 GASCI (www.gasci.com/telephone Nº 223-6175/6) reports that session 588’s trading results showed consideration of $2,989,128 from 93,555 shares traded in 14 transactions as compared to session 587’s trading results, which showed consideration of $898,243 from 37,000 shares traded in 13 transactions. 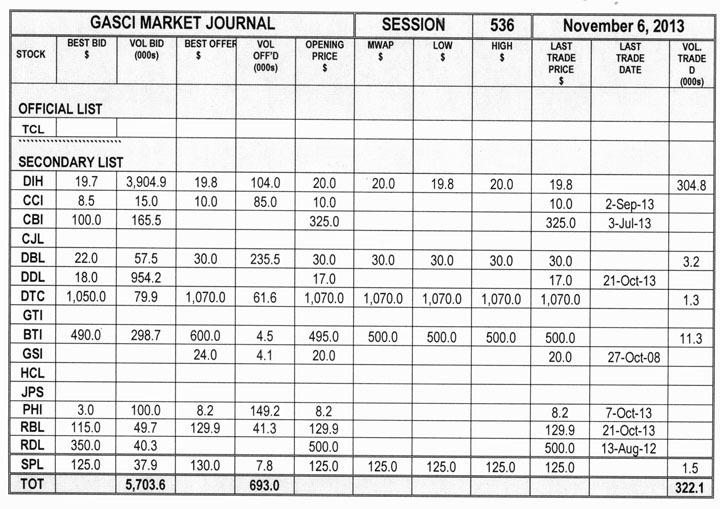 GASCI (www.gasci.com/telephone Nº 223-6175/6) reports that session 587’s trading results showed consideration of $898,243 from 37,000 shares traded in 13 transactions as compared to session 586’s trading results, which showed consideration of $564,267 from 19,100 shares traded in 8 transactions. 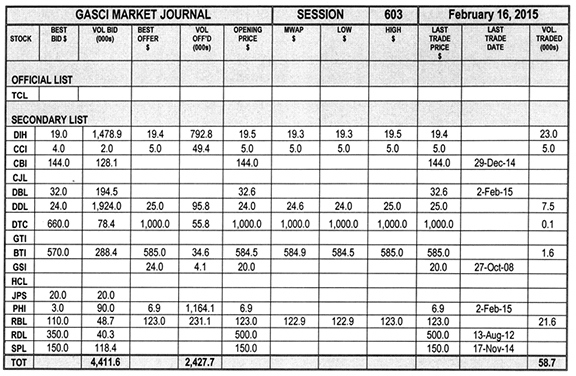 GASCI (www.gasci.com/telephone Nº 223-6175/6) reports that session 579’s trading results showed consideration of $2,066,098 from 84,248 shares traded in 11 transactions as compared to session 578’s trading results, which showed consideration of $2,240,110 from 56,314 shares traded in 16 transactions. 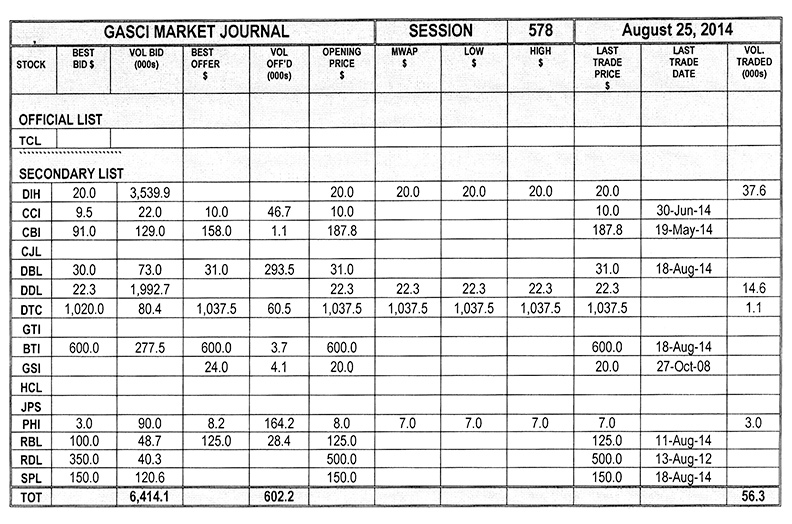 GASCI (www.gasci.com/telephone Nº 223-6175/6) reports that session 578’s trading results showed consideration of $2,240,110 from 56,314 shares traded in 16 transactions as compared to session 577’s trading results, which showed consideration of $5,814,061 from 100,250 shares traded in 11 transactions. 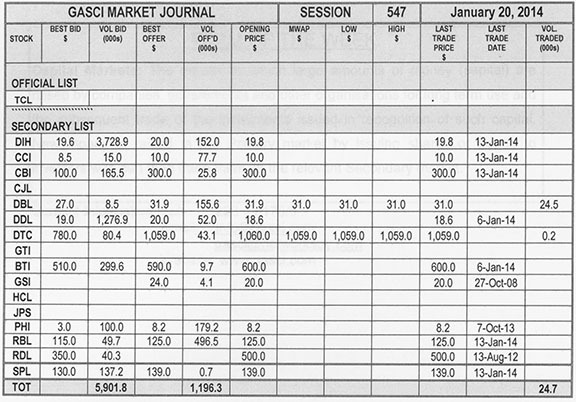 GASCI (www.gasci.com/telephone Nº 223-6175/6) reports that session 577’s trading results showed consideration of $5,814,061 from 100,250 shares traded in 11 transactions as compared to session 576’s trading results which showed consideration of $2,672,849 from 39,432 shares traded in 21 transactions. 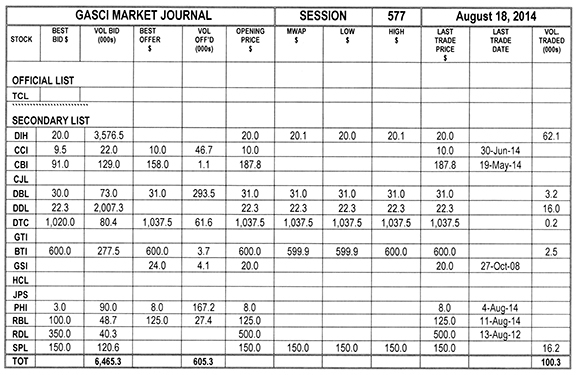 GASCI (www.gasci.com/telephone Nº 223-6175/6) reports that session 576’s trading results showed consideration of $2,672,849 from 39,432 shares traded in 21 transactions as compared to session 575’s trading results which showed consideration of $374,841 from 5,693 shares traded in 8 transactions. 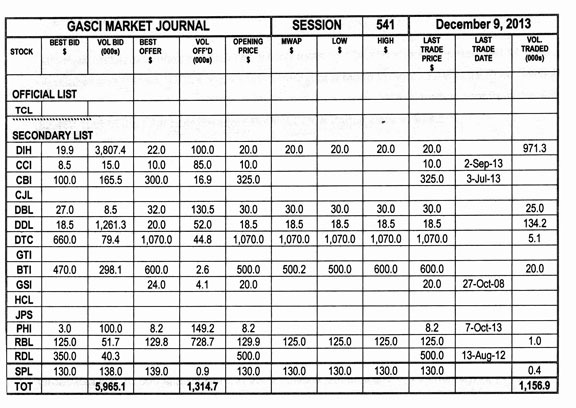 GASCI (www.gasci.com/telephone Nº 223-6175/6) reports that session 574’s trading results showed consideration of $14,233,326 from 145,375 shares traded in 9 transactions as compared to session 573’s trading results which showed consideration of $1,222,490 from 35,831 shares traded in 24 transactions. 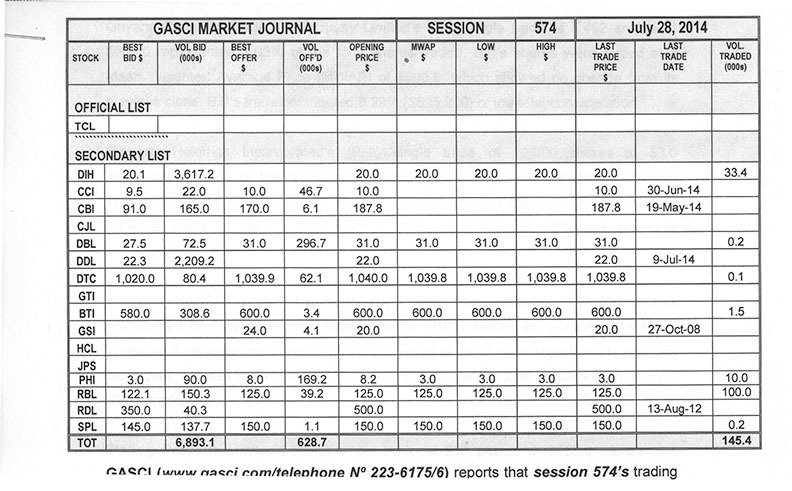 GASCI (www.gasci.com/telephone Nº 223-6175/6) reports that session 573’s trading results showed consideration of $1,222,490 from 35,831 shares traded in 24 transactions as compared to session 572’s trading results which showed consideration of $26,830,218 from 844,386 shares traded in 9 transactions. 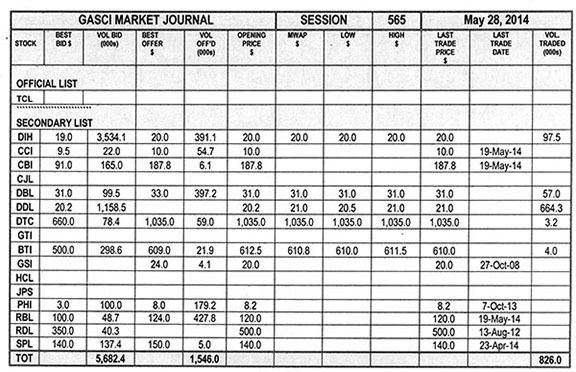 GASCI (www.gasci.com/telephone Nº 223-6175/6) reports that session 567’s trading results showed consideration of $19,833,260 from 504,526 shares traded in 13 transactions as compared to session 566’s trading results which showed consideration of $1,744,761 from 47,771 shares traded in 13 transactions. 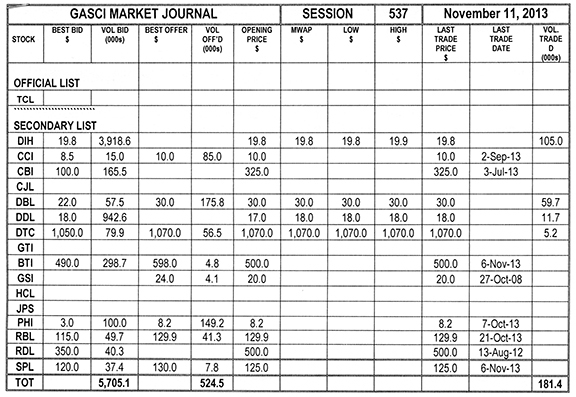 GASCI (www.gasci.com/telephone Nº 223-6175/6) reports that session 566’s trading results showed consideration of $1,744,761 from 47,771 shares traded in 13 transactions as compared to session 565’s trading results which showed consideration of $23,439,905 from 826,008 shares traded in 23 transactions. 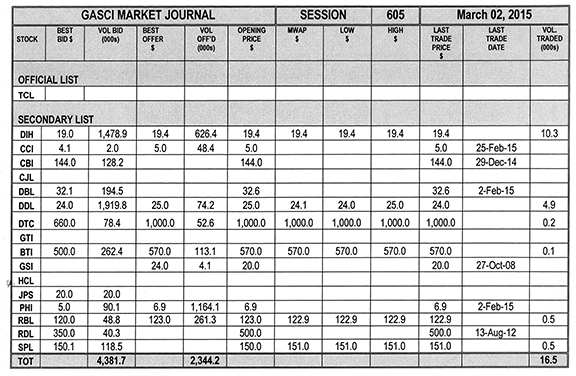 (GASCI www.gasci.com/telephone Nº 223-6175/6) reports that session 565’s trading results showed consideration of $23,439,905 from 826,008 shares traded in 23 transactions as compared to session 564’s trading results which showed consideration of $4,729,698 from 128,610 shares traded in 28 transactions. 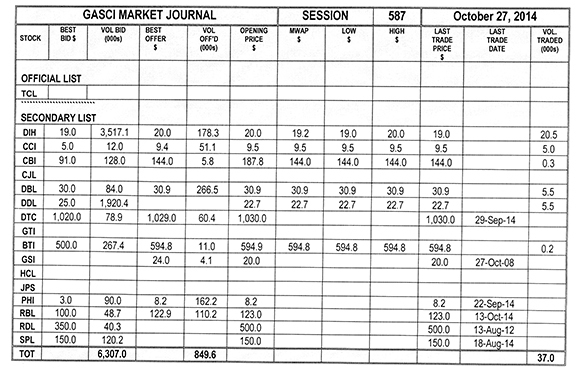 GASCI (www.gasci.com/telephone Nº 223-6175/6) reports that session 564’s trading results showed consideration of $4,729,698 from 128,610 shares traded in 28 transactions as compared to session 563’s trading results which showed consideration of $1,837,858 from 29,414 shares traded in 12 transactions. 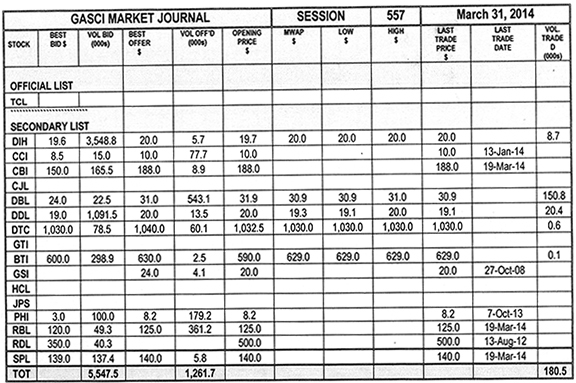 GASCI (www.gasci.com/telephone Nº 223-6175/6) reports that session 563’s trading results showed consideration of $1,837,858 from 29,414 shares traded in 12 transactions as compared to session 562’s trading results which showed consideration of $4,007,504 from 83,108 shares traded in 19 transactions. 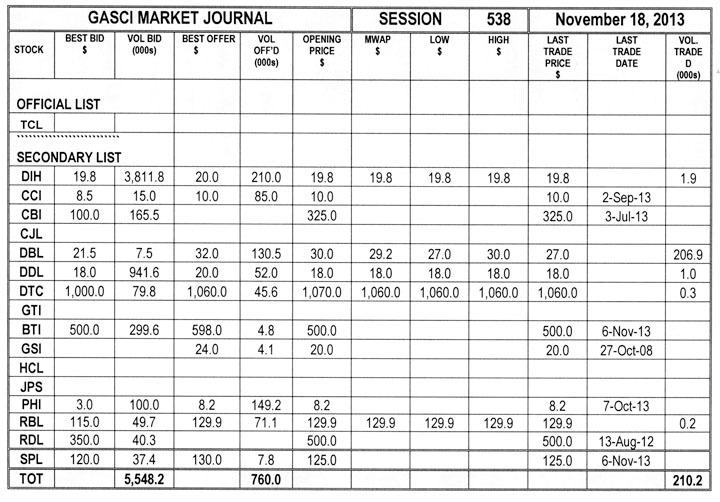 GASCI (www.gasci.com/telephone Nº 223-6175/6) reports that session 562’s trading results showed consideration of $4,007,504 from 83,108 shares traded in 19 transactions as compared to session 561’s trading results which showed consideration of $7,912,971 from 401,233 shares traded in 13 transactions. 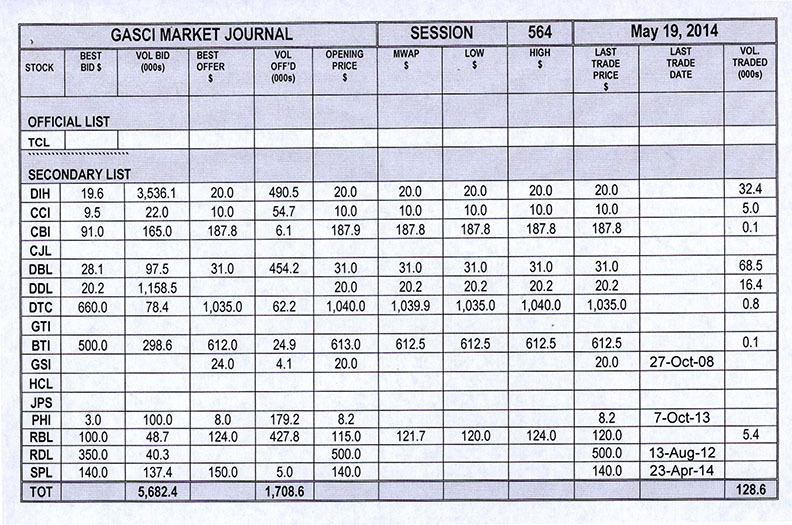 GASCI (www.gasci.com/telephone Nº 223-6175/6) reports that session 561’s trading results showed consideration of $7,912,971 from 401,233 shares traded in 13 transactions as compared to 560’s trading results which showed consideration of $1,464,870 from 53,967 shares traded in 18 transactions. 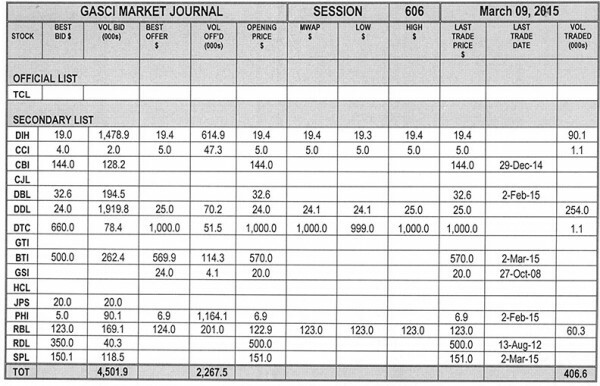 GASCI (www.gasci.com/telephone Nº 223-6175/6) reports that session 560’s trading results showed consideration of $1,464,870 from 53,967 shares traded in 18 transactions as compared to 559’s trading results which showed consideration of $2,085,088 from 58,999 shares traded in 17 transactions. 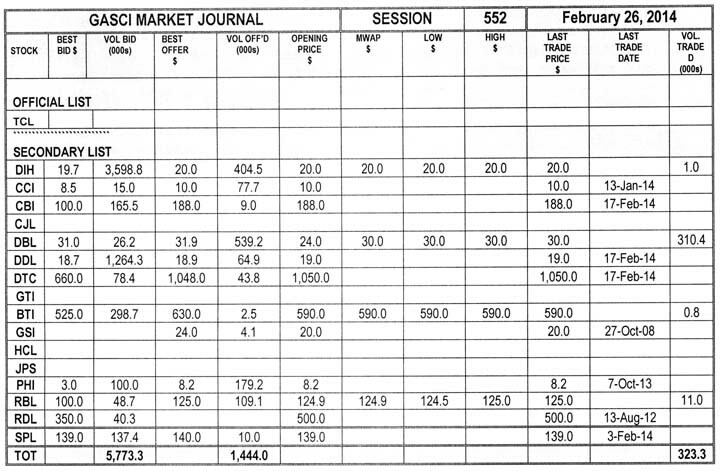 GASCI (www.gasci.com/telephone Nº 223-6175/6) reports that session 559’s trading results showed consideration of $2,085,088 from 58,999 shares traded in 17 transactions as compared to 558’s trading results which showed consideration of $47,368,020 from 595,796 shares traded in 14 transactions. 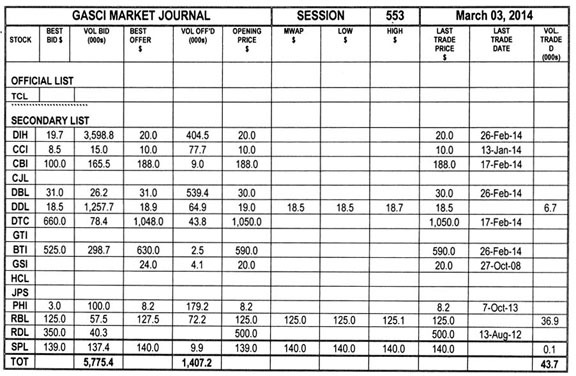 GASCI (www.gasci.com/telephone Nº 223-6175/6) reports that session 558’s trading results showed consideration of $47,368,020 from 595,796 shares traded in 14 transactions as compared to session 557’s trading results which showed consideration of $5,852,934 from 180,483 shares traded in 18 transactions. 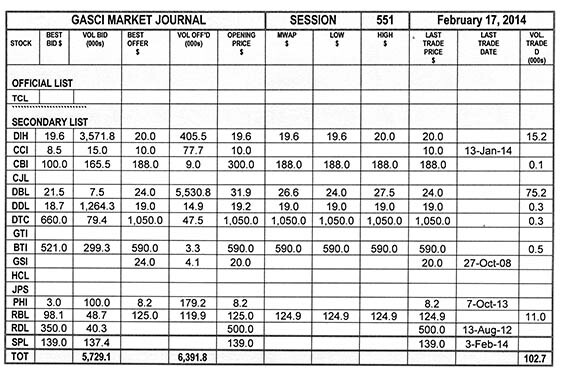 GASCI (www.gasci.com/telephone Nº 223-6175/6) reports that session 557’s trading results showed consideration of $5,852,934 from 180,483 shares traded in 18 transactions as compared to session 556’s trading results, which showed consideration of $5,276,113 from 40,540 shares traded in 5 transactions. 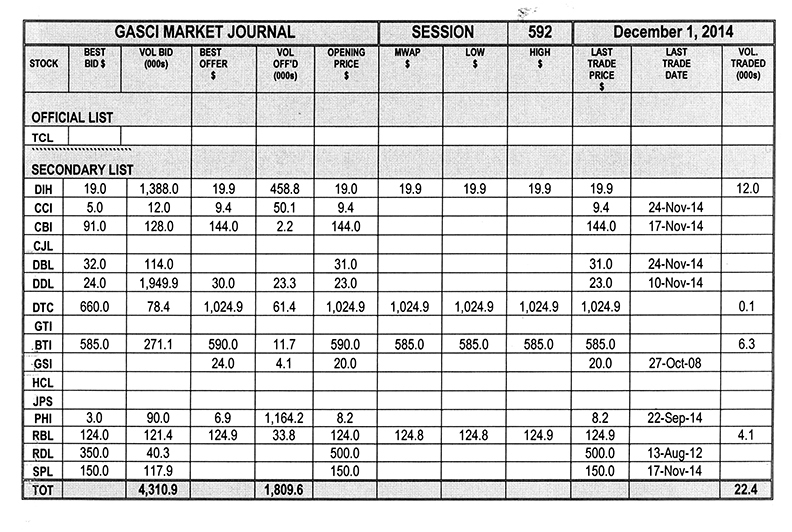 GASCI (www.gasci.com/telephone Nº 223-6175/6) reports that session 552’s trading results showed consideration of $11,206,752 from 323,325 shares traded in 11 transactions as compared to session 551 which showed consideration of $4,352,071 from 102,665 shares traded in 18 transactions. 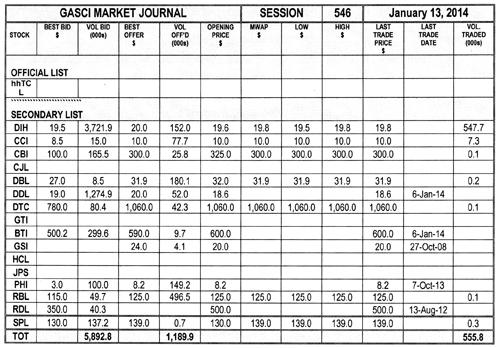 GASCI (www.gasci.com/telephone Nº 223-6175/6) reports that session 551’s trading results showed consideration of $4,352,071 from 102,665 shares traded in 18 transactions as compared to session 550 which showed consideration of $52,981,402 from 437,637 shares traded in 9 transactions. 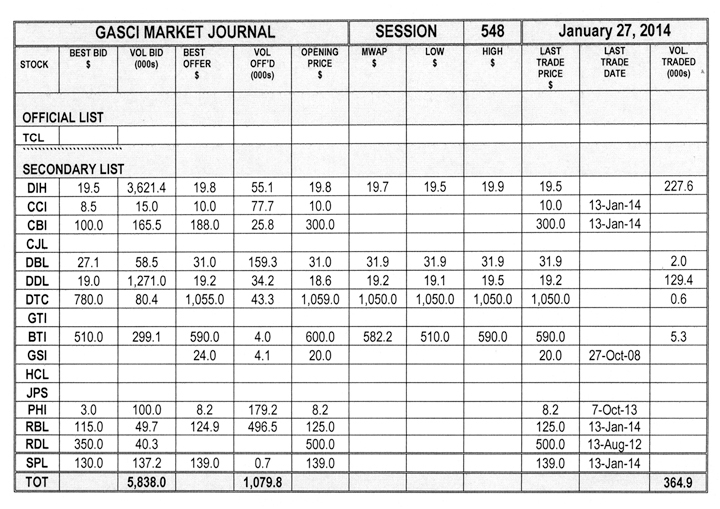 GASCI (www.gasci.com/telephone Nº 223-6175/6) reports that session 549’s trading results showed consideration of $2,542,431 from 105,531 shares traded in 15 transactions as compared to session 548 which showed consideration of $10,741,266 from 364,899 shares traded in 20 transactions. 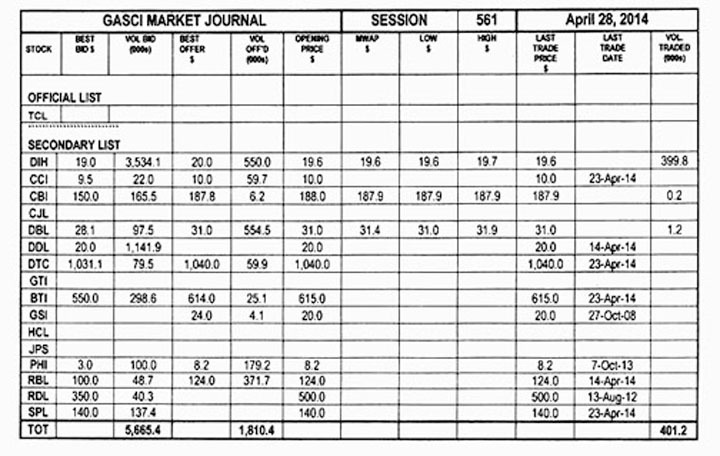 GASCI (www.gasci.com/telephone Nº 223-6175/6) reports that session 548’s trading results showed consideration of $10,741,266 from 364,899 shares traded in 20 transactions as compared to session 547 which showed consideration of $970,866 from 24,686 shares traded in 3 transactions. 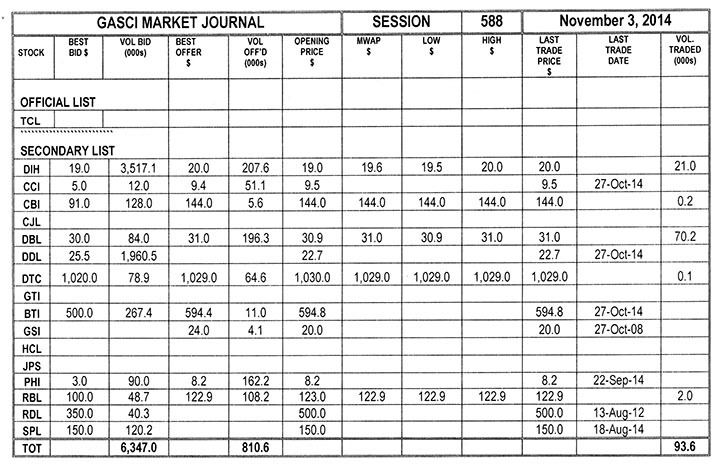 GASCI (www.gasci.com/telephone Nº 223-6175/6) reports that session 547’s trading results showed consideration of $970,866 from 24,686 shares traded in 3 transactions as compared to session 546 which showed consideration of $11,069,577 from 555,767 shares traded in 14 transactions. 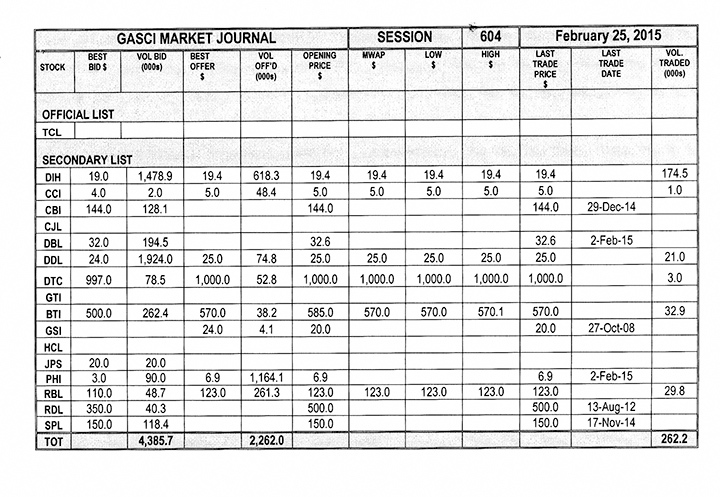 GASCI (www.gasci.com/telephone Nº 223-6175/6) reports that session 546’s trading results showed consideration of $11,069,577 from 555,767 shares traded in 14 transactions as compared to session 545 which showed consideration of $13,044,584 from 197,868 shares traded in 15 transactions. 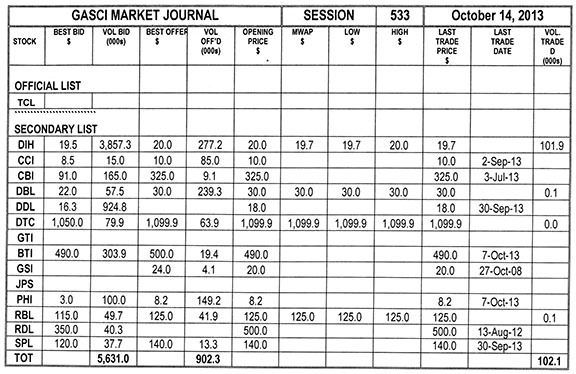 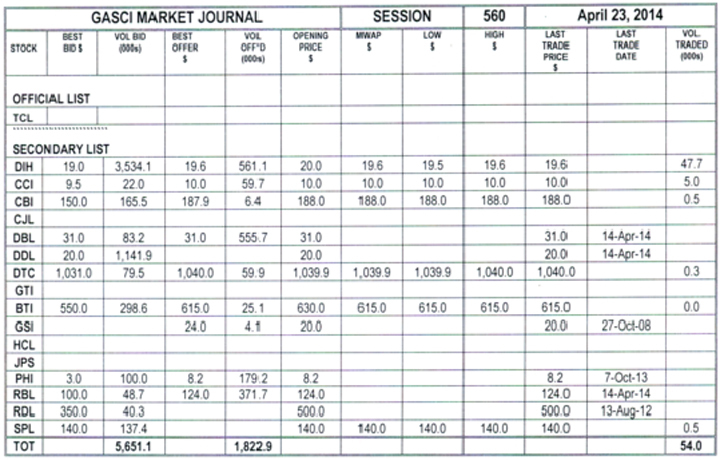 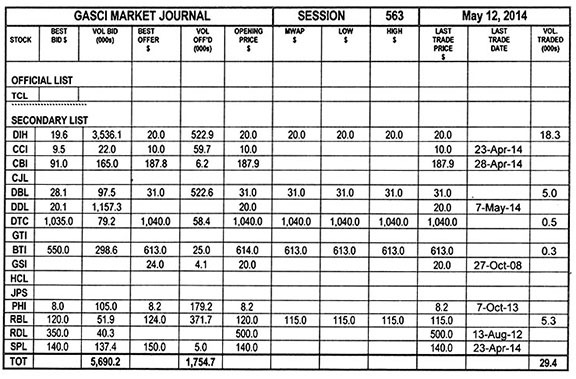 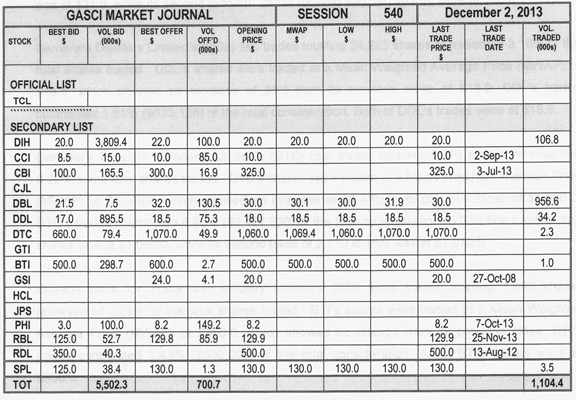 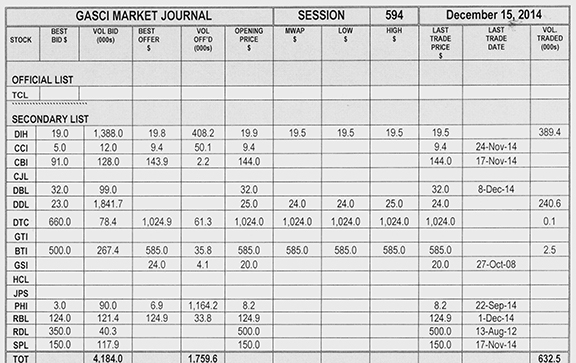 GASCI (www.gasci.com/telephone Nº 223-6175/6) reports that session 545’s trading results showed consideration of $13,044,584 from 197,868 shares traded in 15 transactions as compared to session 544 which showed consideration of $31,090,469 from 373,771 shares traded in 7 transactions. 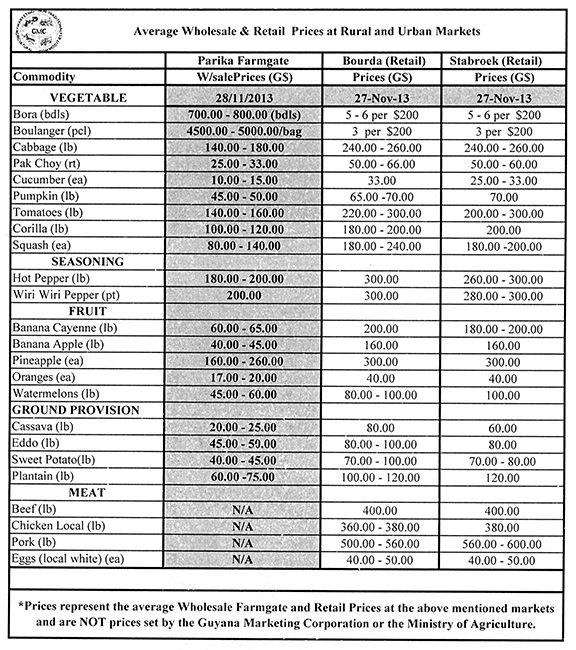 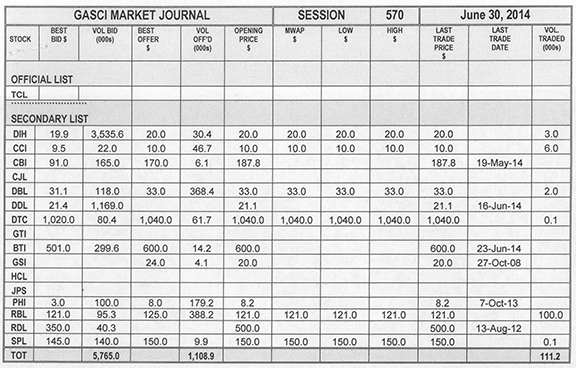 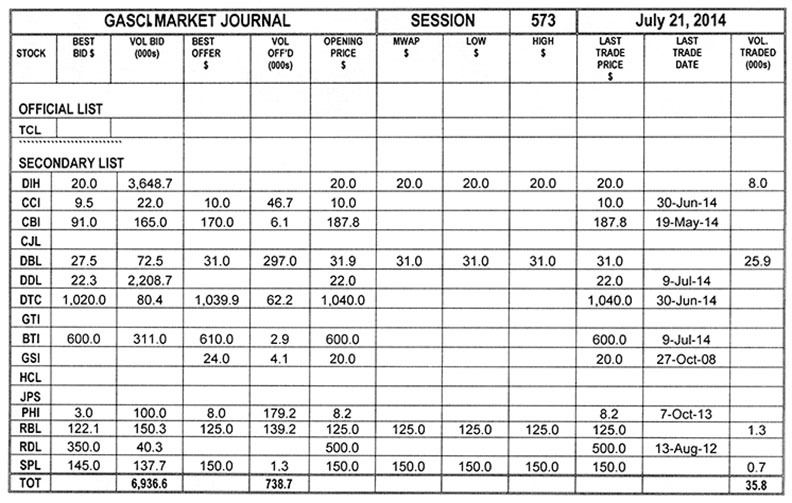 Stock market updates GASCI (www.gasci.com/telephone Nº 223-6175/6) reports that session 540’s trading results showed consideration of $34,906,516 from 1,104,364 shares traded in 20 transactions as compared to session 539 which showed consideration of $7,213,114 from 253,893 shares traded in 20 transactions. 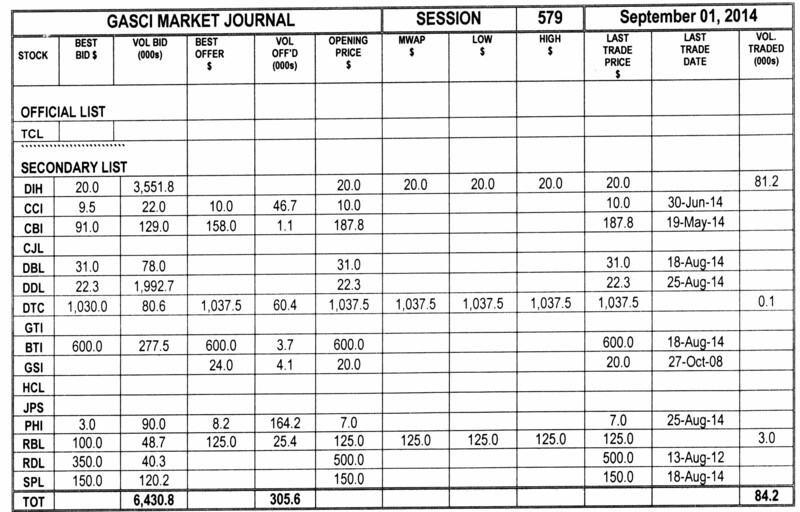 GASCI (www.gasci.com/telephone Nº 223-6175/6) reports that session 538’s trading results showed consideration of $6,397,190 from 210,208 shares traded in 10 transactions as compared to session 537 which showed consideration of $9,591,410 from 181,448 shares traded in 13 transactions. 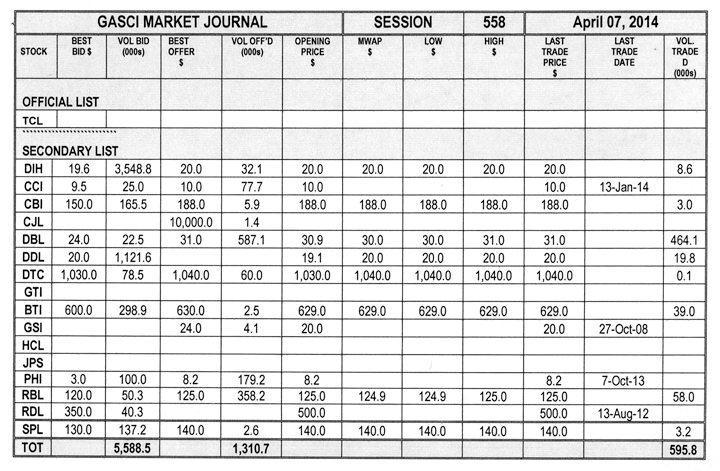 GASCI (www.gasci.com/telephone Nº 223-6175/6) reports that session 537’s trading results showed consideration of $9,591,410 from 181,448 shares traded in 13 transactions as compared to session 536 which showed consideration of $13,360,923 from 322,086 shares traded in 14 transactions. 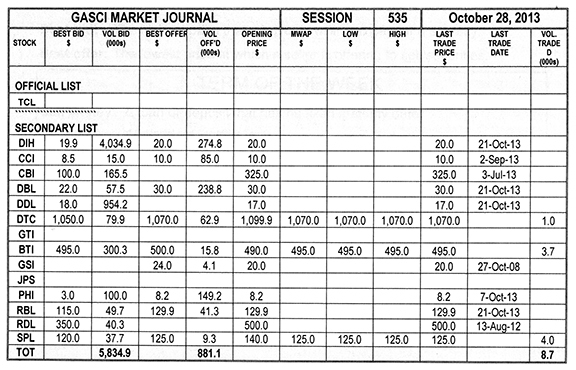 GASCI (www.gasci.com/telephone Nº 223-6175/6) reports that session 536’s trading results showed consideration of $13,360,923 from 322,086 shares traded in 14 transactions as compared to session 535 which showed consideration of $3,388,135 from 8,673 shares traded in 3 transactions. 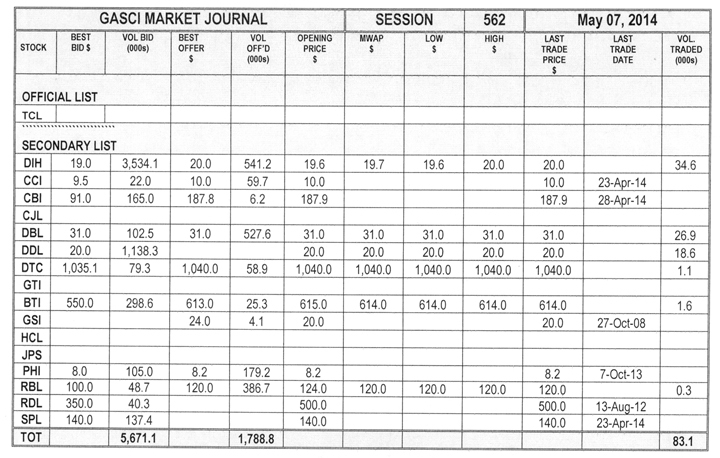 GASCI (www.gasci.com/telephone Nº 223-6175/6) reports that session 535’s trading results showed consideration of $3,388,135 from 8,673 shares traded in 3 transactions as compared to session 534 which showed consideration of $664,454 from 34,269 shares traded in 8 transactions. 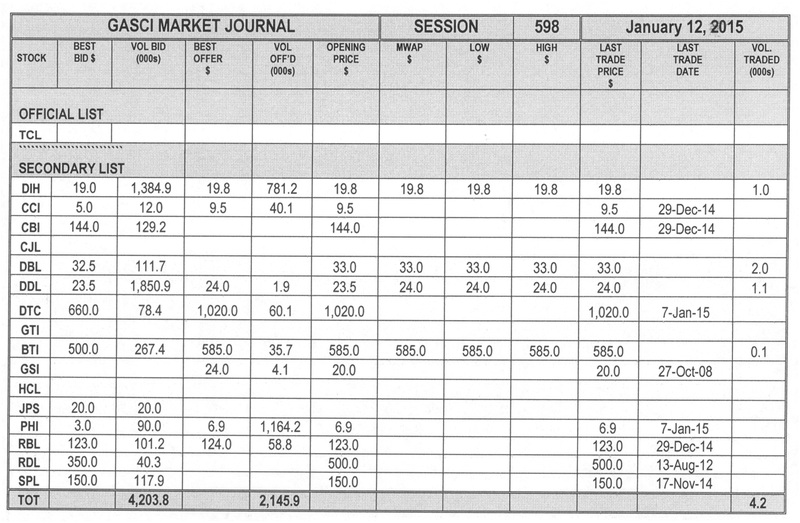 GASCI (www.gasci.com/telephone Nº 223-6175/6) reports that session 533’s trading results showed consideration of $2,066,876 from 102,109 shares traded in 6 transactions as compared to session 532 which showed consideration of $2,189,173 from 10,163 shares traded in 9 transactions.